After the discovery of fire, the next thing that man discovered must have been a knife. Today, knife throwing is picking up fast not only among outdoors enthusiasts, not because they want to practice fighting, but because it’s a game and a very enjoyable one at that. The only thing that you need to throw knives is space and, when camping, you will find a lot of that. To enjoy this sport to the fullest, you have to have the best throwing knives. These knives are designed and weighed especially for effective throwing. This is a distinct category of knives from the ones we use for ordinary chores. Why should you now learn knife throwing? This is a form of entertainment but it should not necessarily be intense. It can be a fun and relaxing activity just like playing pool or darts. It is cheaper to buy a nice set of throwing knives and target. You can then enjoy many hours of entertainment. If you invite friends, knife throwing is a great way to socialize and make friends. You may hold informal gatherings at your backyard or join competitions. There are even organizations such as American Knife Throwing Alliance that organize local knife throwing competitions pitting the best throwers against each other. After learning about the top throwing knives on Amazon, there are a few important factors to consider before you can buy. That is the only way that you are going to get enough value for your money. The difference between a good or bad throwing knives is the material that they are made of. Knives made of poor metal will get scratches, dents, and can snap and even break after a few throws. Good throwing knives should be made of a stainless steel blade. Such makes the knife blade durable and it keeps the knife in good shape for long. Invest in a knife with a dull blade. A sharp blade will be a danger to your fingers and hand. However, the tip should be sharp enough so that it can stick into your throwing board or target. Ergonomics is the science behind a product. Well-measured throwing knives are ergonomically correct. They are safer than knives made without such considerations. Ergonomic correct throwing knives have a comfortable handle that offers good grip. A good throwing knife should be safe in terms of handle shape, weight, and design. A very thin and smooth handle makes a poor grip and can drop easily before the toss. A good throwing knife tip should be of high-quality construction, pointed and sturdy. The tip should be sharp enough to stick into the target, but not too sharp (otherwise, you might get easily injured). Heavier knives are more stable therefore ideal if you are throwing for more than 5 meters. Lightweight knives are harder to control and can bounce off your target instead of piercing. They are just good for short distance throws. A balanced throwing knife has a blade’s center of gravity located at the center with an allowance of 0.6 inches (1.5 cm) in either direction. Well-balanced knives spin in a circular motion towards the intended target. There are different types of knives. This review has the top knife throwing models. 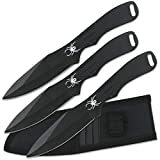 It makes it simpler to choose best throwing knives Amazon, something that will give you more than enough value for your money. These are great throwing knives to practice your throwing technique. They are inexpensive, thus well suitable for beginners who are learning to aim at a target. These knives are balanced and sturdy enough for practice. You can easily stick them to your target. They are lightweight and comfortable to hold. Easy to carry on the belt or backpack as they come with a nylon case. Knife blade made of stainless steel. Measures 7 x 2 x 1 inches (17.8 x 5.08 x 2.54 cm). A set comes with three knives. 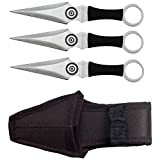 Perfect Point RC-1793B Throwing Knife Set with 3 knives is a set of throwing knives suitable for both beginners and advanced throwers. These knives are lightweight, have black steel blades and black handles too. It will allow you a well-balanced throw. Each throwing knife has a print of a spider. The end of the handle has a laser cut out to allow the user to tie a ribbon at the end. These Perfect Point throwing knives are very affordable too. The 3-pack is nice to start with. Perfect weight for the size creating a good balance. Strong and easy to file tip. Dull edge of the blade to prevent accidental cuts when throwing. A holding sheath for easy carrying. 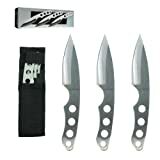 Perfect Point RC-179-3 Throwing Knife Set has 3 knives each 8 inches (20 cm) with silver blades and steel handle. These are good throwing knives for beginners as they offer a well-balanced throw. Each of the knives has a spider print on it. There is a laser cut out at the edge of each handle allowing you to tie a ribbon at the end. You will get your set with a nylon sheath (black) to make it easy to carry. These are durable knives giving value for money. Excellent shape that fits well into the hands of a thrower. Coloring that makes them easier to find. Good quality steel. It is strong enough not to bend easily but soft enough so that it is not too brittle. Well pointed tip that is sharp and sturdy. Knife is pretty but not extremely sharp. This knife has the black cord wrapped handles and silver blades. It is a product of Perfect Point that has an extensive collection of superior throwing knives in various sizes. There is something for each person that is interested in knife throwing. Each of the knives measures 6 ½ inches (16.5 cm). Perfect Point PP-028-3BK Throwing Knife Set will provide you with a well-balanced throw every time you throw. The 3 knives are stainless steel that is engraved with a bulls-eye decoration. All of them have cord wrapped handles to create a superior grip so that the knife doesn’t slip even when you have sweaty hands. Sharp tips making them some of the sharpest throwing knives on sale. Strong blade that hits hard into wood and lodges in deep. Durable tip that stays sharp even after hitting a surface multiple times. One of the best throwing knives for moderate distances because of their mid weight. Each weighs about 0.17 lbs (40 g). These knives are also effective for close up throws. Nice design for knife and sheath. It looks good to carry on a belt. Heavy duty sheath that withstands the strong and very sharp knives. As the name of these throwing knives suggests, it is the TrueStrike and a set is sold with three knives. 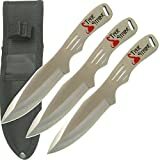 With these knives, you are going to strike your target fast and truly, even though you are a beginner knife thrower. On the same note, these knives are also perfect for martial arts and ninja arts. They have wide blades and the tips are designed to penetrate the target and stick there. You can throw them for as long as you like and they will not get blunt. Being made of stainless steel, these knives will last a long time without rusting. Thus, you can keep them for as long as you like. The size is 8 inches (20 cm). Each knife measures 8 inches (20 cm) overall length. Blade edge 3.5 inches (9 cm). Has a width of 1 inch (2.5 cm). Each knife weighs 3.1 oz (88 g). Made with a stainless steel blade. After considering the kind of knife throwing you want to participate in you have to make a decision on the right set of throwing knives. Amazon reviews are very helpful for comparing the quality and performance of best-throwing knives. If you are a beginner, I would go for anything that is inexpensive. And, since the beginner throwing knives aren’t pricey, I would buy two or three different sets. This way you will learn faster because you will see the difference between different knives and understand better what is best for you. Let me know if you have experience with throwing knives by leaving your comment below. Hey, thanks for great article. 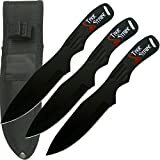 Thanks to you I have placed an order for a set of TrueStrike Throwing Knives. Can’t wait for the package to arrive!! !